Term refers to a station size in the Thin Turret tool style with a station range up to 5/8” (15.87mm). Tool steel that has a higher toughness/hardness ratio, with minimum movement in hardening and a greater wear resistance than oil hardened tool steels. The measured size of the die opening that includes the punch size and total die clearance. The precision keying device that attaches to a Trumpf punch and orients the punch in the press. A special assembly used to provide indelible marking of alpha-numeric characters on the top or bottom of the sheet. Example; for part numbers. A tool station in a punch press that rotates. The flanks of the punch are not parallel. They are angled towards each other slightly. The back taper reduces the friction as the punch strips from the material. An embossing assembly that can hit continuously along the sheet to form a long, strengthening rib. Any part cut from a sheet of metal that is not scrap. Programming a wide section of material between each hit during the first punching sequence and then removing that entire section (or bridge) during another sequence of hits. The shiny, sheared portion of the hole in the sheet metal in between the rollover and the burr. The rough edge that protrudes out of the bottom side of the sheet after punching. The visible part of the burr hanging below the sheet. With optimum clearance, the burr height is approximately 10% of the material thickness. A long-threaded bolt, with a semi-spherical head, used in fastening machine parts. An unsupported protusion of material into a die opening that can result in a die having a higher risk for failure during use. A design feature which prevents a loose punch draw bolt from falling out of the guide assembly. A special assembly tool used to produce a retainer for printed circuit boards. This angle setting method sets 0 degrees at 3:00, and the following angle settings are set counter-clockwise from there. The system is named for the French philosopher and scientist René Descartes. A drawing furnished for all special shape punches and dies used for programming and re-ordering. A special assembly that puts cone-shaped indentations, used for locating, into the sheet. Term used to describe a tool steel with a high chromium content that is allowed to air harden, as opposed to using an oil hardening process. A component of the Mate EasyTap used to hold the taps. Shear on the face of a punch face such that the the center of the punch is shorter than the ends and contacts the sheet last. Shear on the face of a punch face such that the the center of the punch is longer than the ends and contacts the sheet first . The face of the punch is angled upward so that the ends contact the sheet last. Allows a screw head to reside flush or below the surface of the material. Company that represents and sells Mate products. This tool creates a countersink in the sheet and has a surface that flattens the material around the countersunk hole. It is used specifically for one material thickness and one screw size, and the depth of form is up to 85% of the material thickness. It is used with a blank die. A tool that supports the sheet metal as the punch penetrates through it. The die opening must be larger than the punch. 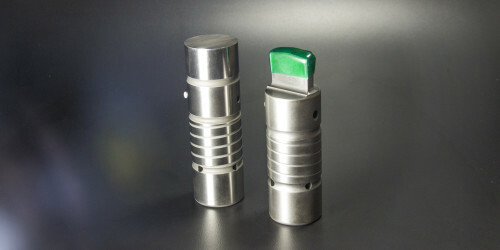 The die size is determined by the material type and thickness being punched. Similar to a die holder but typically holds more than one die. For example, a multi tool. The difference in size between the punch dimensions and the die dimensions which allows for the proper shearing of the material being punched. Based on the thickness and type of material being punched. Holds the die into the lower turret. The usable cutting edge of the top surface of the die. The plane at which the top of all standard dies sit, when properly installed. A pin in the die for locating in the die holder. A machining process that allows a Slug Free die to have a positive entry taper and negative exit taper. Essentially the profile of the die aperture is machined twice: once to create the entry taper, and once to create the exit taper. A pin in the shape of a double “D”, with two flat sides and two rounded sides, used to securely locate the tool in place. This design feature is commonly used with open ended louvers and clip style lance and form tools. The draft angle allows the cut material to pull back into a space in the tool that is larger than the material. This minimizes the stripping force required and prevents the form from becoming deformed during stripping. The relative shore hardness of urethane. A highly accurate machining process that uses an electrical charge to remove material. A special assembly that forms without cutting, producing raised or sunken designs in sheet metal. Used as a stiffener to add rigidity to sheet metal panels. To produce a logo or design on a part. A punch, used with a blank die, to stamp characters .005”-.008”(0.13mm-0.20mm) deep in sheet metal. Some examples are numbers, letters, and logos. The engraving of a number, letter, or combination thereof, on a tool used for identification purposes. Used to identify special shapes and special assemblies. A key attached to the outside of the punch holder that locates it in the turret bore. The forming of material upward, usually in a round shape. It is normally pre-pierced, then formed. Usually designed to accept self-tapping screws. Threading for screws and increased bearing area for tubes, etc. Component used to secure two parts together. The useable space between the upper turret and lower die available for forming and sheet metal travel. A protruding rim, edge, rib, or collar used to strengthen an object, hold it in place, or attach it to another object. Tool used to move metal instead of piercing it. An operation that shapes the material. A punch shear ground in four different quadrants that meet in the center. Close fitting stripper provides support and guiding at the punch point. Accurate and close tolerances between the stripper and guide assure a precisely located punch point. Metal depositing on the sides of the punch point. A system of measurement for the thickness of sheet metal. The maximum useable length that can be removed from a punch or die by sharpening. Material is heat treated to achieve the optimum material hardness, and is then ground to the precise dimensions required by the application. Any process of increasing hardness of metal by suitable treatment, usually involving heating and cooling. A die with an added extension that fits into the inner bore of the die holder. Made from S7 tool steel, a hat die provides extra strength for use in tough applications. Style of tooling designed for thick material applications .157”(4.0mm) and over. Hinge is made of two pieces. Each piece includes one or more interlocking knuckles to create a hinge. A special assembly form that creates a jointed device on which a door, gate, shutter, lid, or other attached part turns, swings, or moves. Tool steel used for making punches and punch inserts. The hardness is 60-62 Rockwell C scale. The measurement of the interior periphery of a round shape or form. Any time you rotate a punch and die to an angle within a 360 degree range. A tool designed for use in auto indexing stations that cuts both inside and outside radii without stopping the machine to remove the slug or blank. A key attached to the inside of a guide that locates the punch in the guide. A device used for location and/or alignment. One example is a key to position tooling in a holder, or the holder in a turret. The process of cutting and forming material, except the slug is held into the sheet metal by a tab or tabs. Used for air flow, decoration, card guides, location markers, shear tabs, wire harnesses or clip attachments. Tools used to align the upper turret with the lower turret. A metal disk placed beneath a nut or at an axle bearing to relieve friction, prevent leakage or distribute pressure. Used to provide air flow or ventilation. Term is used to reference the components of a special assembly that fit into the lower portion of the punch press. A substance capable of reducing friction, heat, and wear during punching and forming operations when introduced as a film between solid surfaces. High speed steel with extremely good wear resistance. This is a premium material used for punches. A high speed, particle metallurgy steel designed for use in high performance. A combination of the chemical composition of M4, the particle metallurgy manufacturing process, and a triple temper heat treatment process. A premium tool steel coating made up of zirconium, titanium and nitride that helps eliminate galling on the punch tips. The rated force that a press is designed to exert. A specialized tool holder designed to hold more than one punch and is usually located in the auto-index station of a punch press machine. The fine surface finish on the flanks of Mate punches. The smooth finish reduces friction to eliminate galling and extend tool life. The creation of an opening or hole using multiple hits with a tool, typically at high speed and in small increments. A gas heat-treating process used to produce a hard, wear-resistant layer on high speed steels. It can be used advantageously only on tool steels that do not temper back excessively at the nitriding temperature, 975o C.
A design available for forming applications that do not require stripping in the lower tool. To cut or make an indentation in something. This involves removing the material from the corner of the sheet, often at an angle, to allow bending. A flat ring made of rubber or plastic, used as a gasket. The measurement of the exterior periphery of a round shape or form. When the entire periphery of the punch is not engaged with the material being punched. In forming this refers to the raising of the edge of the sheet parallel to the sheet, typically one material thickness in height. Warpage or bending caused by punching or forming the sheet metal. A shear on the face of a punch where one end contacts the sheet first and the face of the point is at an angle. The creation of a line of separation between parts/scraps typically made with a long, narrow tool. The process of punching a number of uniformly spaced holes in a piece of metal. The holes may be any shape, and they usually cover a large portion of the entire sheet. The desired result of the punching process. A special tool required to punch a hole through an embossed area. A special assembly that pierces and forms sheet metal in one hit. A special assembly that pierces and extrudes sheet metal in one hit. The general term for cutting, shearing or punching openings, such as holes and slots in sheet material, plate, or parts. A tool component used for locating or holding a tool in place. The distortion in the edge of sheet metal caused when sharp tools are overlapped during slitting operations. A flat punch used with a blank die to push a knockout back into the sheet (75% maximum). A collet that features a square socket to accept the square tang of the machine tap. The stripper holds the material securely on the die, as the punch pierces through the metal and is then extracted from the metal. The stripper mechanism strips the material from the punch as the punch exits the material. Material that has been machined, using a grinding process, to achieve the precise dimensions required by the application. A machine used to punch holes in sheet metal used to make metal products. A tool used to pierce through sheet metal. One component that is comprised of the spring canister and guide and is used to hold the punch. The minimum and maximum diagonal dimension of a station size. The point of the punch that actually pierces through the sheet metal. The process of using a punch and die to pierce a hole or opening, or to form a shape, or stamp a surface. A corner on a punch and die that has been rounded. The part of the punch press machine that contacts the tool and forces the punch through the sheet metal. The distance that the ram in the press travels. A relieved area in a tool that provides space to avoid formed areas on the sheet. Clearance obtained by removing metal, either behind or beyond the cutting edge of a punch or die. A stripper with material removed to allow space for forms or adjoining tools. A solid die with a spring loaded ball bearing installed which supports the work piece and allows it to clear the feed gap for easy travel. Used in stations adjacent to forming stations. The top part of the sheet that is drawn and formed into the hole being punched. A tool steel having a composition that makes it tougher and more resistant to high punching forces. It is used in heavy duty die applications to minimize the possibility of die failure. A shearing assembly used for parting, slitting and sheet squaring. The ScissorTool™ Assembly is designed for use in auto indexing stations which permit programmed cutting at any angle. A set of instructions included with special assemblies, used to assist in setting up tools. The main body of the tool. The geometry of the punch face, other than flat. It helps reduce tonnage because it is not hitting with the full face of the punch. Used for locating tabs in sheet metal for further fabrications such as shearing and spot welding. Metal rolled into a sheet with a a thickness between foil and plate. A screw used to fasten together sheet metal components. A thin piece of metal used to fill in space between items. A finishing process designed to remove surface stresses from tooling components to increase fatigue resistance. Particularly applicable in the manufacture of springs. The distance from the bottom of the machine ram to the top of the die, when the ram is at the bottom of the stroke. This is particularly important when installing forming tools. The pieces of material (usually scrap) which are produced when punching holes in sheet metal. Refers to dies, which have an hourglass taper to prevent slugs from pulling back up with the punch. Slug Free® is a registered trademark of Mate Precision Tooling. Slugs return through the die opening. A small urethane cylinder pressed into a hole in the face of the punch used to push the slug off the punch face. A hole in the face of the punch for urethane slug shedders to be inserted. A station size in Thin Turret tooling with a station range maximum of ½”. A tool used to perform a special piercing or forming application as required by the customer. A shape other than a round, square, oval or rectangle. A design used for forming applications that require stripping in the lower tool to assure the material is removed from the tool. A position in the punch press that holds a tool, punch or die, of variable sizes. Tooling component used to remove material that surrounds the punch point. A component of a guide or tool holder that secures the stripper plate in place. A metal plate designed to surround the punch. Its purpose is to strip the sheet metal from the face of the punch. The process of removing the punch from the sheet metal. A machined feature on a tooling component that provides an interface between the tool holder and the machine ram. An individual tool for cutting an internal screw thread. Taps are available in different sizes depending on the desired thread size. A tool to make several threaded holes in sheet metal. A generic term to describe a modern tooling style developed by Amada and adopted by several other punch press manufacturers. A generic term to describe an older tooling style developed by Amada and adopted by several other punch press manufacturers. A special assembly to provide a form to accept a sheet metal screw (button head). A hole created for holding a threaded screw. A sheet metal forming application that traps the material being formed between the upper and lower tool, to allow the material to be deformed to create the desired result. To create a threaded hole in sheet metal. This may be done in a pierced or extruded hole. The measurable force needed for punching or forming sheet metal. Steel used to manufacture tools for high speed punching in sheet metal. A measurement of a twisting force. For example, a measurement of how much to tighten a screw. The size difference between the punch and the die that allows the punch to fit through the die and make a clean break in the sheet metal. A revolving tool holder in a machine. The name is derived from the manner in which tools are mounted in the press. An upper turret holds the punch holders (punches), and a lower turret holds the respective die holders (dies). The precision hole in the press that receives the upper guide assembly. ULTRA® is a premium tooling style for thick turret style machines. Term is used to reference the components of a special assembly that fit into the upper turret. Similar to a punch holder, but typically holds more than one punch, for example a multi tool. A hard plastic material used to make strippers for 112, 114 or Trumpf tooling and slug ejectors for punches in all tooling styles. Thin pads made to fit the diameter of the punch face that help reduce sheet metal marking and loud noise. To produce logos, messages or symbols. A punch shear geometry, made popular by Trumpf, where the face of the tool is angled in two directions. A punch having a flat face. Any material part or piece that is being processed or handled to or from a processing operation.